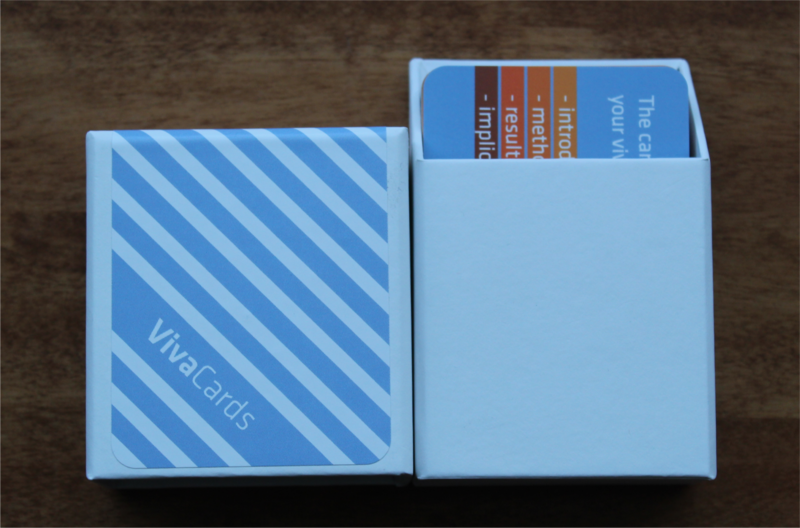 They are printed on high quality, matte cards with rounded corners and a laminate coating to ensure they stand up to rigorous use in the run up to your viva. Business card size, with their own sturdy box to keep them all together, they are ideal for throwing in your bag and carrying with you, so you can grab the opportunity to flick through them when your train is at a standstill, or the bus is stuck in traffic, or your mate is late to the pub. The laminate coating means that they and robust and forgiving too. Pin them to your noticeboard, tape them to your monitor, blu tack them to the wall, use them as bookmarks, coffee coasters, whatever works for you. These bright and cheerful, yet core questions, are guaranteed to get your mind focused when you need it to.